Protective effects of ischemic postconditioning in myocardial ischemia/reperfusion (I/R) injury have been ever demonstrated, but the exact mechanisms remain unclear. Because of their multiplex activities, using natural pharmaceuticals seems to be clinically interesting. 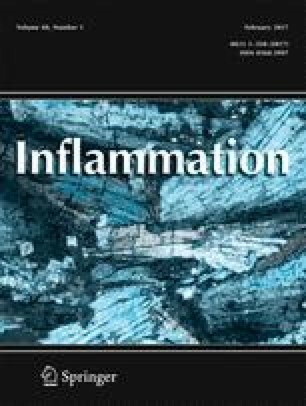 The aim of present study was to investigate the effects of troxerutin preconditioning and ischemic postconditioning on inflammatory responses after myocardial I/R injury in a rat model. Twenty-four Wistar rats were divided into four groups as the control, troxerutin receiving (TXR), postconditioning receiving (PostC), and combined therapy (TXR + PostC). Rats’ isolated hearts underwent 30-min LAD regional ischemia followed by 45-min reperfusion. Troxerutin was orally administered for a month before I/R. Ischemic PostC was applied by alternative three cycles of 30-s R/I at the onset of reperfusion. The coronary effluent and ischemic left ventricular samples were used to determine the activities of creatine kinase (CK), intercellular adhesion molecule-1 (ICAM-1), interlukin-1beta (IL-1β), tumor-necrosis factor (TNF-α), and also histopathological studies. Pretreatment of rats with troxerutin significantly reduced myocardial inflammatory cytokines TNF-α and IL-1β levels and ICAM-1 activity after I/R insult compared to those of control I/R hearts (P < 0.05). Application of PostC showed similar impacts on those parameters. In fact, anti-inflammatory mechanisms of both treatments were associated with their protective effects against myocardial damages causing from I/R injury. Pretreatment with troxerutin as well as postconditioning can induce cardioprotection through prevention of the cell-cell interaction and release of inflammatory mediators, minimizing I/R pathological changes in myocardial cells. These two treatments may share same mechanisms in their actions since they showed no significant additive effects. This study was supported through a grant from Immunology Research Center and Drug Applied Research Center, Tabriz University of Medical Sciences, Iran.